It was a great day at Afaraukwu Ibeku (Mazi Nnamdi Kanu’s Residence) on the 2nd day of April, 2019, as IPOB AKWA IBOM and Akwa Ibom Elders came all the way from Akwa Ibom to Mazi Nnamdi Kanu’s residence to pay courtesy visit to the Jewish occupants of the palace with bags of rice, garri and other valuable goods. The meeting started with Biafra songs which was sung in their dialect, and everyone danced to the Glory of God Almighty in heaven. Meanwhile, Halleluyah Nwachukwu led them in an opening prayer and committed the whole activities and meeting to the hands of Elohim. The visit featured members of IPOB AKWA IBOM and BICOE ELDERS which include Bishop Tete Peter (AKWA IBOM BICOE CHAIRMAN), Obong Vincent James Udoh (Akwa Ibom BICOE Secretary), Akparawa Emmanuel Udonmah (Akwa Ibom IPOB Coordinator), Apostle Saint Divine Edeth (Akwa Ibom Deputy Coordinator), Rev. Ebenezer ( Akwa Ibom Mobilization Officer), Dede Emmanuel Ibonabasi Ibom (Akwa Ibom Secretary), Akuku Sunday Okon (The Akuku), Saviour Nkwororo (The Ikpaisong of Aborokara), Elder Emmanuel Essien, Charles Ume Obi (A business man in Akwa Ibom from Anambra State), Pastor Ikpe Orji, Gabriel Akpan (Ikot Ekpene Local Government Coordinator), Sir Samson Kamta and others too numerous to mention. The meeting also featured some dignitaries like Halleluyah Nwachukwu (Jewish prophetess), Uzoamaka Ejezie (Biafra Land Women Leader) and so many others. After the opening prayers/supplication, Kolas were broken and shared among everyone, then the meeting commenced. The Coordinator of Akwa Ibom, Mazi Emmanuel Udonmah started with the opening speech which he said “Gone are the days of divide and rule, we now know who we are, we are brothers from the same parents, we posses same DNA, if you look around, you will see both Igbo speaking Biafrans in our mist living in love and harmony, that’s to show you that we love and never hated one another despite the divide and rule tactics introduced by the Nigerian government”. He also thanked the people of Akwa Ibom who have always showed love and support to him, promised to serve them better and prayed that God would keep blessing them. He also went further to tell them that Biafrans are just like orphans because they are everywhere. Supporting his statement with an adage he said, “before an orphan dies he/she will have so many homes”; hence we must restore our sovereign state, he echoed. He expressed gratitude to God for giving us someone like Mazi Nnamdi Kanu who opened our eyes to the truth. He, therefore, warned Nigerian government not to beat the drum they can’t dance. Furthermore, he linked Biafrans to their great father Abraham, which he buttressed his point by asking a rhetorical question which is “If you doubt that we are the descendants of Abraham, then who taught us how to circumcise our male child eight days after birth?”. He also cried out to the abnormalities going on in Nigeria, in his statement he said, “It is only in Nigeria that a professor will go ahead to rig election for an illiterate tyrant. It is only in Nigeria that lawmakers will shamelessly go ahead to make laws in favour of an illiterate and a tyrant. "We must say the truth the way it is, we can’t be quiet because Biafra must be free. "Let’s move leg by leg with our leader Mazi Nnamdi Kanu and ensure that we restore Biafra. Let’s do everything humanly possible to ensure that Biafra is restored, he concluded. Bishop Tete Peter (AKWA IBOM BICOE CHAIRMAN), in his own speech expressed gratitude to Akwa Ibom Elders who came out en masse to support the quest for the restoration of Biafra. He also advised them to always bless Mazi Nnamdi Kanu every moment “because without him we won’t know we are one, but now we eat together, drink from same cup, eat from same plate and use same spoon” he said. "They the Nigerian government tried all they could to ensure we see our brothers as enemies until Mazi Nnamdi Kanu surfaced and opened our eyes, that’s to tell you that “No matter how long lies last, the truth must prevail”. Finally they discussed on important issues and presented some food items which include bags or rice, garri and so on which they came with to the occupants of the palace. 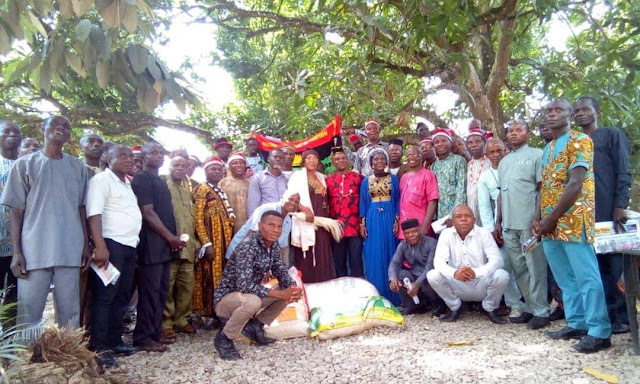 Halleluyah Nwachukwu (Jewish Prophetess) and other occupants who received them happily thanked them for their care and support, and also said that IPOB Akwa Ibom was the first to visit them after the Nigerian government attacked the palace. She also made it clear that this is their fourth time of coming to the palace with gift items and so on. She then prayed for them, asked Elohim to bless and protect them always, and advised them to remain resolute regardless of the storm. The meeting ended successfully and everyone journeyed back to their various destinations.